At least that's what the song says. The death care industry paints a different picture. There is a concerning peak in deaths during that period from Christmas to New Year's, and there really isn't any rhyme or reason to it. We all know that suicides stemming from seasonal and holiday depression tend to spike at the time, but so do deaths from natural causes. The holiday season can add additional stress, especially for those living in cold, snowy climates. There is a heightened social schedule. Businesses start to make that end-of-the-year push. Finances get tight as everyone tries to keep up with the Joneses and their presents. Even the food becomes a danger, as holiday parties lead to more sweets, fatty foods and libations. These factors are more anecdotal than anything and don't provide any scientific support for the rise in deaths around the holidays. In the death care industry, it's not our job to figure out the causes. We just must be ready to help the families when they deal with death at this tough time. You wouldn't be in the death care industry if you didn't exhibit compassion, but during this time of year, it's even more crucial. It can be hard to maintain compassion during this period because you are stressed yourself. You are experiencing all the stressors mentioned in the introduction to this article, so it makes sense that your patience could be wearing thin as well. Take a lot of deep breaths, spend as much time as you can relaxing, and always keep in mind that the family didn't choose this time of year to have this tragedy strike. They would rather be enjoying the season, too. So, you are in it together! Spread holiday cheer with decorations. It used to be taboo to decorate a funeral home for the holidays, but that has long since passed. You want to avoid religious themes as much as possible, as you might be hosting services for people of many ethnicities and religious beliefs during the season. Also, stay away from animatronic and cartoonish displays as they might be found in poor taste as well. Soft lights, lush greens, holiday ribbons, bows and candles are just a few examples of ways to trim your facility in a tasteful way to help spread some cheer, even during a trying time. Use this season to throw a community event. If your home is going to be decorated and look great, it would be a great time for an open house. Coordinate with your city or town to host a community open house to invite people to connect in your space. Chances are you've got one of the largest venues in town, and it's a warm, inviting place to have a get-together. Sure, it would cost you an evening for hosting a funeral, but it would be an investment in your future, helping those who haven't been inside your doors before to see all that you have to offer. You don't have to go over the top - light refreshments and socializing are enough but open your doors and let people see you at your best! Don't plan a vacation for this time of year. Not that a funeral director knows what a vacation is, right? When that snow hits, our first instinct is to follow birds and fly south for the winter, but you'll be best served to wait it out for a few weeks before you take off on your vacation. If the staff is short-handed, that is just going to make it worse on them. Things like shipping and floral arrangements can get very tight around this time of year, and it will take a full staff to accomplish every task. Wait a few weeks for your retreat - the islands will still be there after the holidays! The holiday season can be a great time to show just how great you are at what you do. It will test you. It is a gauntlet. But if done right, the holidays can showcase why you are the best in your area at taking care of the families you serve. 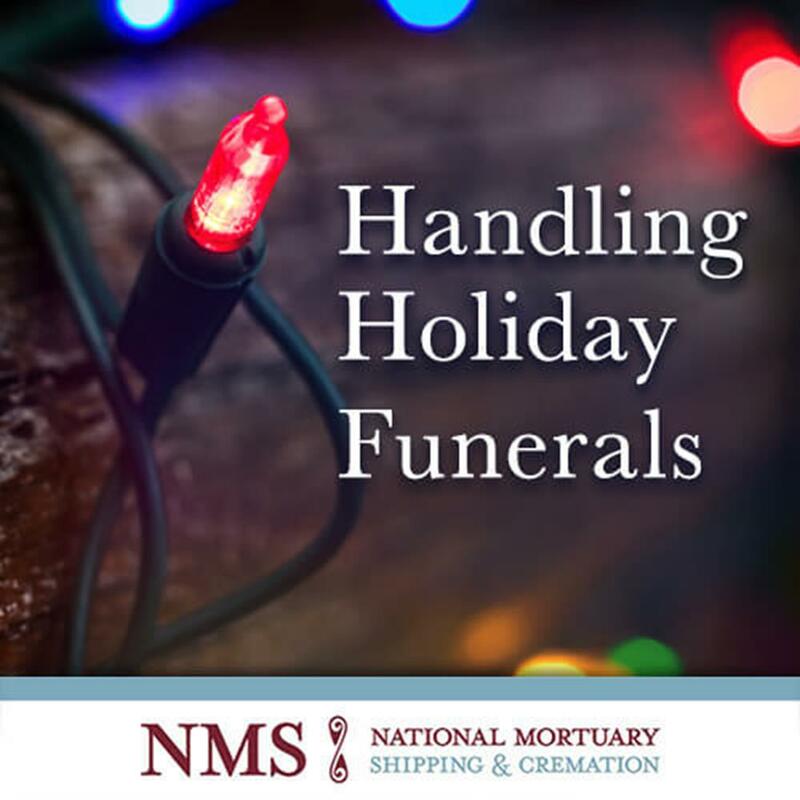 Think of National Mortuary Shipping as your elves! We will let you be Santa - taking care of families and spreading joy - while we take care of the details behind the scenes. Contact us today to see how we can make your holiday rush easier!